The President Pranab Mukherjee will present the Shilp Guru Award and Sant Kabir Award for the year 2009 and 2010 to twenty Handicrafts Artisans and eighteen Master weavers in New Delhi today, informed ministry of Commerce and Industry in a release on Thursday. Besides this, he will also present a total of seventy four National Awards to master craftspersons and master weavers, it said. Anand Sharma, Minister of Commerce, Industry and Textiles; Kiran Dhingra, Secretary (Textiles); S.S. Gupta, Development Commissioner (Handicrafts); and Monika Garg, Development Commissioner (Handlooms), will also attend the award ceremony. 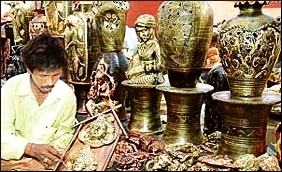 The Shilp Guru Award for the Master craftpersons was introduced during the year 2002.These awards are conferred to legendary master craftspersons of Handicrafts whose work and dedication have contributed not only to the preservation of rich and diverse craft heritage of the country, but also to the resurgence of handicrafts sector as a whole. Each Award consists of one mounted gold coin, one shawl, Certificate and a Tamrapatra. In addition, financial assistance to the extent of Rs.6.00 lakhs is also given to each selected Shilp Guru Awardee to innovate and create five new products of high level of excellence, high aesthetic value and high quality befitting the stature of the Guru. Sant Kabir Award has been introduced in 2009 and this award is conferred on such outstanding weavers who have made valuable contribution in keeping alive the handloom heritage and also for his dedication in building up the linkages between the past, present and the future through dissemination of knowledge on traditional skills and designs. Each Sant Kabir Award consists of one mounted gold coin, one shawl, certificate and a Tamrapatra. In addition, financial assistance to the extent of Rs. 6.00 lakhs is also given to each selected Sant Kabir awardee to innovate and create 10 new products of high level of excellence, high aesthetic value and high quality. National Awards to Master Craftspersons and master weavers were introduced in 1965. The award comprises of a cash prize of Rs.1,00,000/-, a certificate, Tamrapatra and an Angavastrarm. The Awardees of these two years represent almost all States of the country apart from different crafts and weaving styles of different locations in the country. Out of the total twenty Shilp Guru Awardees, eighteen are male and two are female. For Handicrafts artisans, forty National Awards for the years 2009 & 2010 will be conferred to a total of forty seven master craftspersons including seven joint awardees. Out of these forty seven Awardees, forty are male and seven are female. The main crafts in which Awards will be given are Art Metal engraving , Wood carving, Sandal wood carving, Stone carving, silver Filigree, Miniature Painting, Madhubani Painting, Pattachitra Painting , Dhokra Craft, Bell metal, Phad Painting, Koftgari Art, Blue art pottery, Bone carving, Batik Printing, Hand embroidery Kantha, Chikan Embroidery, Enamel Kundan Jewellery etc. For Handloom weavers, thirty four National Awards for the years 2009 & 2010 will be conferred to a total of forty six master weavers including twelve joint awardees. Out of these nine are female awardees. The main weaving styles in which National Awards will be given are Cotton & Jamdani Saree, Rangat Saree, Ajrakh Prints, Tantra in Tapestry, Patan Patola, Paithani brocade saree, Muslin silks, Telia rumal, Himroo shawl, Karuwa design saree, Chakdo, Hand block printed Bed Cover, Baluchari Saree, Tie & Dye, Double Ikat Silk Saree , Pashmina shawl and Shreekshetia Wall Hanging etc. Eighteen weavers have been selected to confer Sant Kabir award for the years 2009 & 2010.